and Linköpings universitet in Sweden. 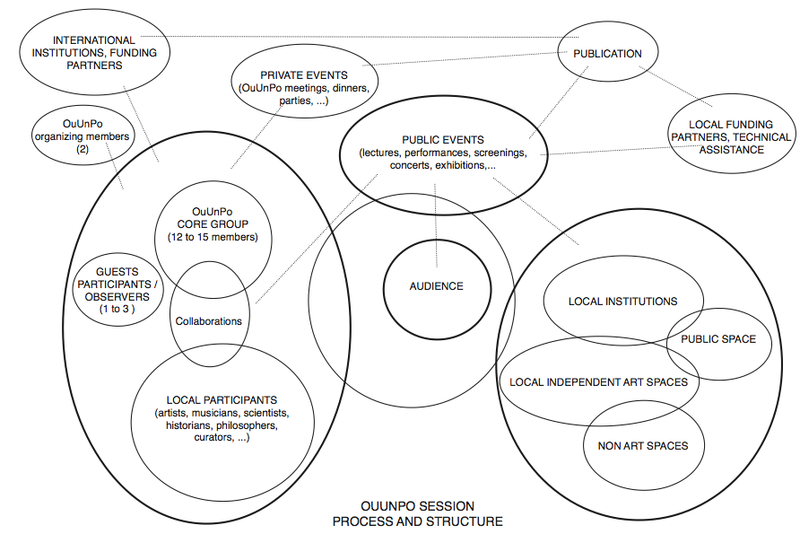 OuUnPo is a group of artists, curators and researchers, and operates like an itinerant laboratory co-creating and sharing knowledge through artistic production. Two or three times per year, the group organises sessions in different countries, focusing on a different topic in each location. Each session merges aspects of the festival, the art exhibition and a scientific symposium. The program is well balanced and addresses serious topics in an entertaining fashion. Since 2009 OuUnPo has worked on «Orality» (Athens, Greece), «Urgency and Leisure» (Belgrade, Serbia), «Neuro-imaging and Creativity» (Nijmegen, Netherlands), «God and Multiverse» (Rome/Skopje/Paris) to name a few. OuUnPo collaborates both with well-established institutions, alternative venues and informal groups. Trans-disciplinarity is of a key importance for the group and a session mixes events as diverse as performances, film screenings, happenings, music events, lectures, discussions, scientific talks and hybrid forms of these. The OuUnPo artists and researchers who visit Japan are known as OuUnPonians. 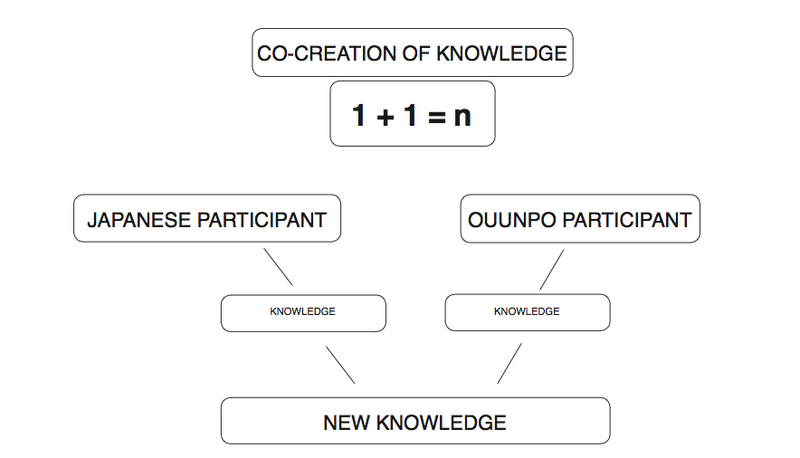 OuUnPo is an integral part of the network Vision Forum that is currently hosted by Linköpings universitet, Sweden. Each session is a platform for the meeting between local artists, curators, scientists, institutions in the visited city and the visiting OuUnPonians. The ten-day session in Japan is arranged so that it offers both new perspectives to existing problems and generates creative insights for the future. The session creates a bridge between art, science, daily life and their respective audiences. The OuUnPonians come from a dozen different European countries and many different disciplines. The local participants are both invited by OuUnPo and by the local partners. Often after a session some of the local participants are invited to become OuUnPonians in one or more future sessions. In collaboration with ZKM in Karlsruhe OuUnPo will organise four sessions that look at how heritage and crises are linked. Apart from Japan, sessions will be organised in Lebanon, Sweden and Brazil. OuUnPo will explore the similarities and differences in how people respond and deal with situations of regeneration in each country– and most importantly, how negative situations can be used for the development of new ideas and solutions. The outlook is therefore both affirmative and towards the future and not in remembrance of the past. OuUnPo has chosen two mythical creatures, Godzilla and the Phoenix as a starting point. The theme will be a tool to develop the group’s specific working methods in dialogue with local partners in Japan. The goal is to use local knowledge to gain a deeper understanding of how renewal and creativity are interlinked. By promoting diversity and inspiring difference, OuUnPo and its partners offer tools to encourage future problem solving capabilities. Godzilla and the Phoenix represent east and west, creation and destruction, but also underline that every fundamental societal change is based on a different outlook on the world. Creativity is therefore always a renegotiation of accepted values. Creativity dialogues with traditions, transforms or even breaks them. The session will address issues like: how can historical problem resolution help and/or mislead us in the present? How do our expectations of the future shape how we see the reality that surrounds us and how we act in the present? How can exchanges between different disciplines and between different cultures offer tools to help us to foster creativity and safeguard diversity? 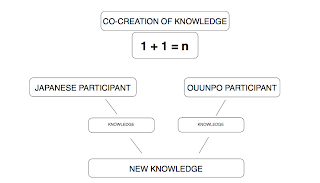 Since 2009 OuUnPo has developed a specific methodology during a dozen sessions in different countries. Nourished by these experiences, OuUnPo will provide expertise and offer a unique program of events with exciting content. Each event will be developed specifically for the hosting venues and institutions, reflecting or reacting to their current program. The sessions are formed around collaborations between local creators and the visiting OuUnPonians. The exchanges can take many different forms. The dialogues are based on shared interests or overlaps in artistic or scientific practices – whatever it takes for people to engage in a meaningful exchange. Each of the ten days is broken down into a series of longer and shorter events. Each event is free-standing and self-contained so that a visitor can choose to attend a single event, a whole day or the entire session. 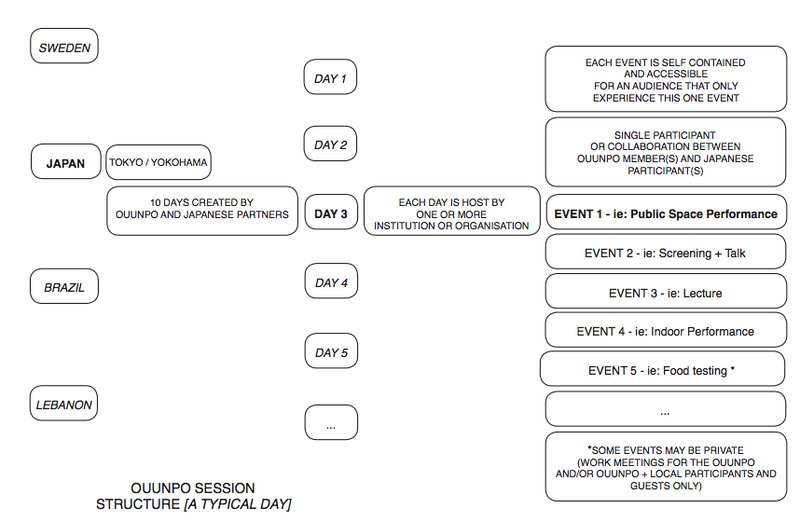 During the session OuUnPo will also offer alternative outlooks on existing exhibitions, collections and architecture. 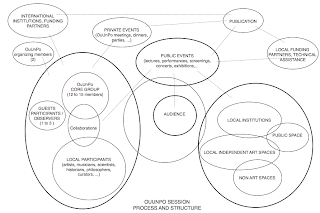 OuUnPo does so by creating special performances, guided tours and other interfaces that comment on the context - all with the aim of enriching the level of understanding between the creators, institutions and audiences. OuUnPo’s sessions offer an alternative outlook on communication, where creation of knowledge takes place in dialogue between the participants, the audience, the artworks and the local context. The exchange, based on dialogues around a given problematic, therefore evolves in multiple directions. "For OuUnPo individuality and difference are resources. These qualities allow the group to maximize the potential of the intercultural exchange at each individual session. 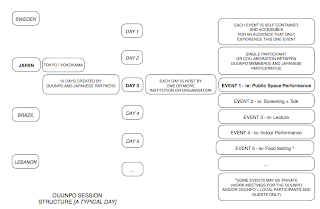 The OuUnPo events are participatory on every conceivable level. For instance the sessions often invite the audience to contribute to discussions and performnces. This means that the boundaries between creator and audience are blurred. This is also a reason why the OuUnPo sessions are loved by the audiences - everyone who engages in the event is invited to participate in the reflection and creation." As part of the wider project, OuUnPo is investigating specific topics and problems in Lebanon (December 2012), Sweden (September 2013) and Brazil (March 2014). A concise publication that documents the four sessions will be designed by the French design group Åbäke in 2014.